Will The Middle still be able to bring in solid ratings now that Wednesday nights are getting even more competitive? Stay tuned to find out if we’ll be able to continue watching The Heck family’s story. 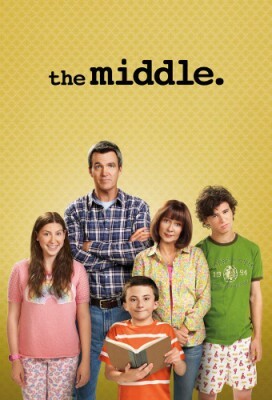 The fourth season of The Middle typically airs Wednesday nights at 8pm on the ABC network. Once again, the cast includes Patricia Heaton, Neil Flynn, Charlie McDermott, Eden Sher, Atticus Shaffer, and Chris Kattan. Below are the TV show’s ratings for the 2012-13 season, the best way to tell if The Middle is going to be cancelled or renewed for a fifth season. Final season averages: 2.3 rating in the 18-49 demographic with 8.01 million total viewers. 2.0 in the demo (+5% change) with 7.70 million (+14% change). Season averages: 2.28 in the demo with 8.01 million. 1.9 in the demo (+6% change) with 6.76 million (-1% change). UPDATE: ABC has renewed this show for a fifth season for 2013-14. 1.8 in the demo (-10% change) with 6.80 million (-8% change). Season averages: 2.30 in the demo with 8.07 million. 2.0 in the demo (0% change) with 7.41 million (-2% change). Season averages: 2.32 in the demo with 8.13 million. 2.0 in the demo (0% change) with 7.55 million (+5% change). Season averages: 2.34 in the demo with 8.16 million. 2.0 in the demo (+11% change) with 7.22 million (+5% change). Season averages: 2.36 in the demo with 8.19 million. 1.8 in the demo (-14% change) with 6.90 million (-13% change). Season averages: 2.38 in the demo with 8.25 million. 2.1 in the demo (-9% change) with 7.97 million (-4% change). Season averages: 2.41 in the demo with 8.33 million. 2.3 in the demo (+21% change) with 8.27 million (+7% change). Season averages: 2.43 in the demo with 8.35 million. 1.9 in the demo (-17% change) with 7.72 million (-6% change). Season averages: 2.44 in the demo with 8.35 million. 2.3 in the demo (-8% change) with 8.21 million (-4% change). Season averages: 2.48 in the demo with 8.40 million. 2.5 in the demo (+9% change) with 8.55 million (+4% change). Season averages: 2.49 in the demo with 8.41 million. 2.3 in the demo (-4% change) with 8.21 million (-2% change). Season averages: 2.49 in the demo with 8.40 million. 2.4 in the demo (+14% change) with 8.39 million (+15% change). Season averages: 2.51 in the demo with 8.42 million. 2.1 in the demo (-9% change) with 7.29 million (-9% change). Season averages: 2.52 in the demo with 8.42 million. 2.3 in the demo (-12% change) with 7.98 million (-9% change). Season averages: 2.57 in the demo with 8.55 million. 2.6 in the demo (-4% change) with 8.79 million (-3% change). Season averages: 2.60 in the demo with 8.62 million. 2.7 in the demo (+4% change) with 9.04 million (+3% change). Season averages: 2.60 in the demo with 8.60 million. 2.6 in the demo (+4% change) with 8.80 million (+5% change). Season averages: 2.58 in the demo with 8.52 million. 2.5 in the demo (+4% change) with 8.39 million (+6% change). Season averages: 2.58 in the demo with 8.47 million. 2.4 in the demo (+9% change) with 7.90 million (+2% change). Season averages: 2.60 in the demo with 8.48 million. 2.2 in the demo (-24% change) with 7.72 million (-16% change). Season averages: 2.67 in the demo with 8.68 million. 2.9 rating in the 18-49 demographic with 9.16 million total viewers. Season averages: 2.90 in the demo with 9.16 million. Year-to-year, The Middle was down by 7% in the demo (vs a 3.1 rating) and down by 6% in viewers (vs 9.74 million). However, these were the best numbers for the sitcom since January 2012. Reference point: The 2011-12 season averaged a 2.6 rating in the 18-49 demographic and 8.41 million viewers. What do you think? Do you still like The Middle TV series? Do you think it should be cancelled or renewed for a fifth season? Last month. Im thinking, what a funny show! Equally! They are so unique, each ones personality interesting. How amazing is that? Thank you writers :). Please renew this show. Please???? Wonderful clean cut show!!!!! True to life ! Very cute. Love love love it!!! The above is a good example of fast strategies to grow a business on the Internet. is very important to make sure that you are using the right graphics and words. I have to say this is one of the few shows I actually look forward to watching of course I always have to watch it on the abc app since I have church on Wednesday night’s I really hope they don’t cancel this show anytime soon I love it! !